In this article, we bring you a checklist of some of the most common problems encountered when 3D printing parts and offer simple 3D printing tips on how to resolve them. Please note that these problems relate to FDM 3D printing. Considering the endless list that users encounter when 3D printing, we intend to publish this article in two parts to make sure that we cover most if not all the problems. This is the Part I of the list of 3D printing problems. Read on to know the common problems in 3D printing and learn how to resolve them to have a successful 3D printing experience. 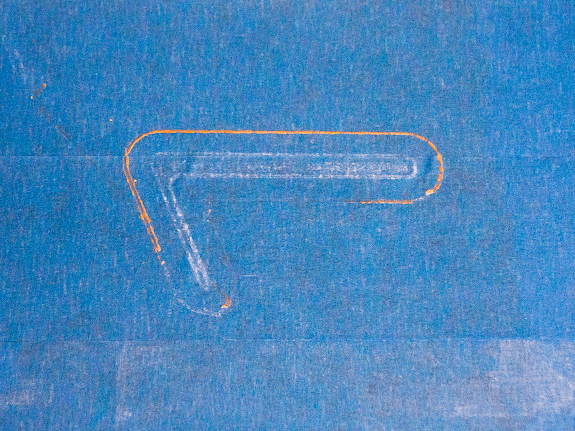 This problem refers to a condition where the first layer of the print does not stick to the bed. This is one of the most common problems in 3D printing encountered by 3D printer users. This is also one of the most critical problems as without proper resolution of this issue, the prints will never be successful. Before starting any print, it is important to check the bed levelling. If the bed is not levelled appropriately then the first layer may not stick to the plate. Check the temperature of the bed while starting the print. 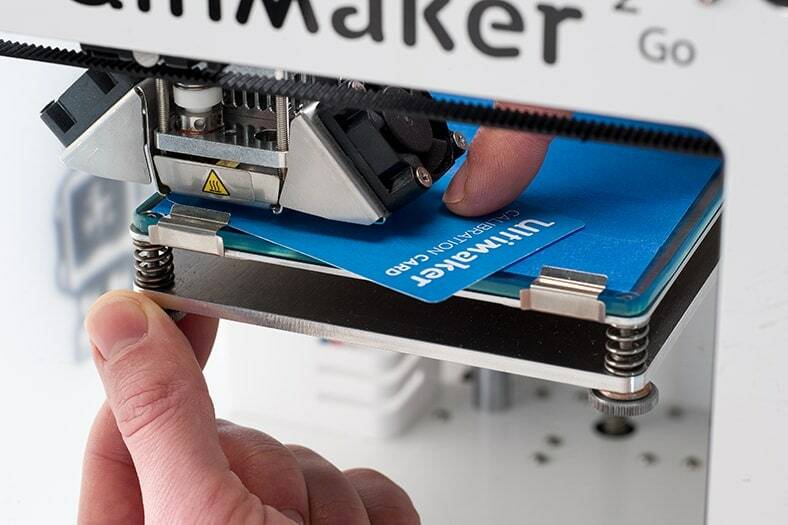 Some materials require a heated bed to ensure that the print sticks to the bed. Set the print speed to the optimum level. The print speed can significantly affect the layer adhesion. Faster the speed, lower the bed adhesion. Check the fan speed of the print. It is recommended to keep the fan speed low for the first few layers and in case of ABS switch off the fan completely. Nozzle height can also affect the layer adhesion. This is mostly a one-time adjustment where the nozzle height from the bed is adjusted to an optimum level. If the nozzle is too high from the bed then the deposited layer will not stick or even fall at the desired location. If the height is too low then the nozzle itself may scrape the deposited material. If layers are not sticking to the bed, then one solution to ensure proper layer adhesion is to use external adhesive agents like tape, glue or ABS slurry. 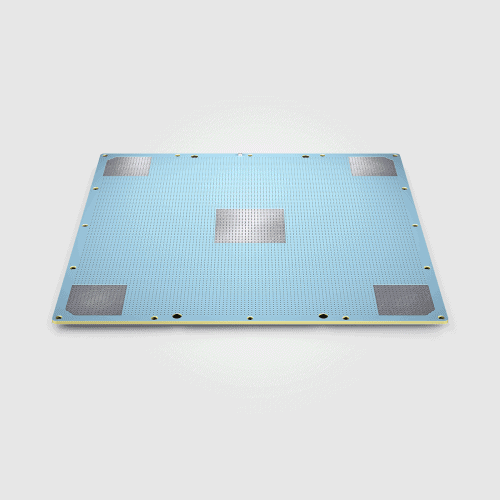 All these can augment the layer adhesion property of the bed for the initial layers. This is a widely used method and almost always solves the problem. Slicing software also provides solutions to this dreaded common problems in 3D printing. 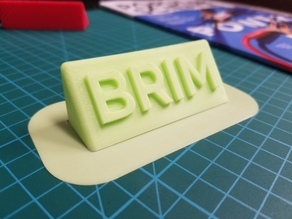 Tools like ‘Brim’ and ‘Raft’ can significantly improve the adhesion properties of the part. These tools are found in all slicing software and using them can solve the adhesion issues to a far extent. This is also one of the most common problems in 3D printing especially experienced by new users. But luckily this problem is easy to resolve. The following is a list of some of the possible reasons and corresponding solutions to resolve this problem in 3D printing. 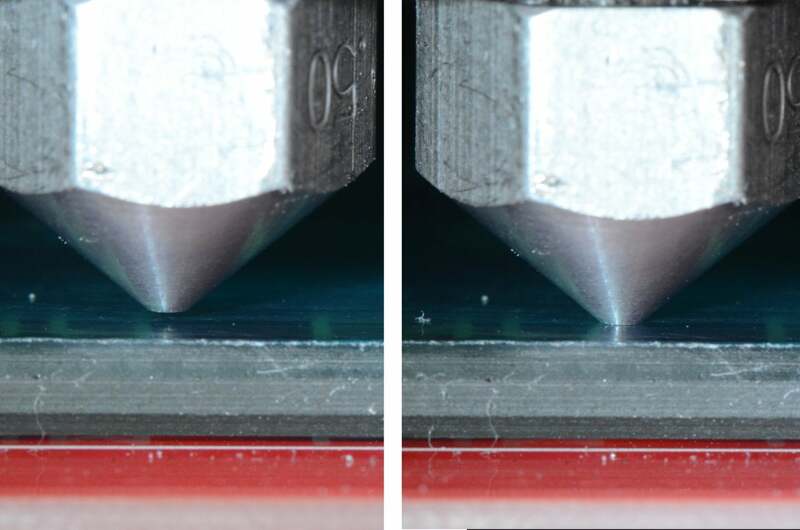 Clogging of the nozzle is one of the most common reasons for an extruder to not perform its main function. The nozzle can clog due to many reasons like blocking due to external rubbish like accumulated dust, fine particles which cling to the filament. These particles, over a period of time, stick to the inside walls of the nozzle and once they gather in sufficient quantities can lead to blockage of the nozzle outlet. 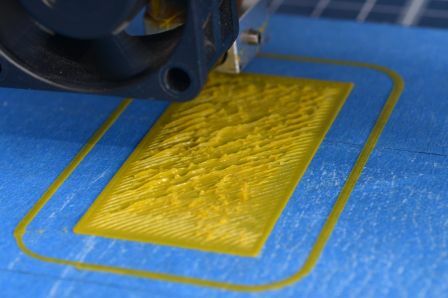 This can also occur simply because of the regular plastic material sitting inside for a long time (generally happens when the filament is not removed after print completion and it sits for a prolonged period of time like months). Users may have to remove the nozzle and resolve the issue by contacting the manufacturer as it requires critical work to unclog the nozzle. Priming is very important at the start of every print and should be carried out every time. This occurs because while the extruder is being heated the material sitting inside starts melting and some of the material starts dripping/oozing down from the nozzle. This causes a void in the nozzle and when the actual print starts, the nozzle does not extrude the material. But in fact, it is only a delayed extrusion which has occurred due to the initial oozing of the material. So, start all your prints with a few layers of ‘Skirt’ which will help in maintain a regular flow of the material before it starts printing the actual model. Nozzle height can also affect the extrusion of material if the nozzle is too close to the build plate then the extruder may not be able to deposit the required amount of material on to the bed. So, it is important to set the nozzle height appropriately. This problem in 3D printing sometimes goes unnoticed. While the users try to assess the problem, they tend to overlook the fact that the filament may have been damaged. Many times new users do not store the filaments appropriately and this can expose the material to ambient conditions which can deteriorate the material. This causes the filament to break, gather moisture leading to various printing issues. Sometimes while printing the filament snaps into two beneath the drive system (mostly occurs in a direct drive system). This may go unnoticed and the extrusion may completely stop while the printhead continues to move in prescribed geometry. This can also be caused due to scraping of filament due to hard drive gears. The gear teeth bite into the filament and this upsets the extrusion flow leading to intermittent extrusion. This can also occur is the filament absorbs so much moisture that it forms air bubbles. These air bubbles block the flow and again disrupt the extrusion flow. 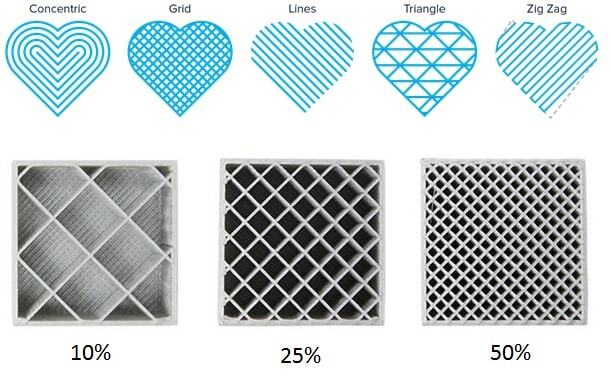 Infill is an important parameter to consider while printing. If not carefully managed, it can cause problems in 3D printing. The infill density and pattern play an important role in the strength of the parts. It also dictates the stability & shape of the model. So, it is important that the infill is carefully selected and used. Read on to know how you can resolve this problem in 3D printing by acting on the mentioned pain points. 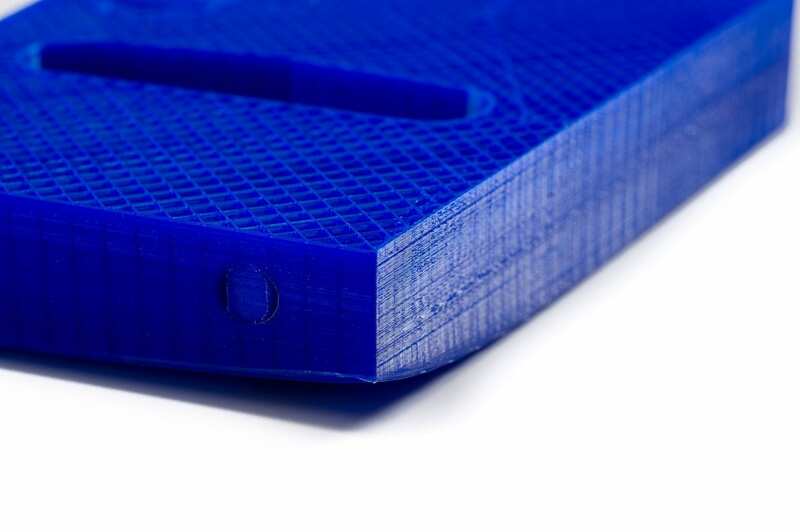 Print speed is an important factor affecting the infill. Generally, new users do not ascertain enough importance to the infill and tend to print the infill at faster speeds. This is a grave error on the part of the user. As mentioned above, the infill serves many purposes and it should be printed with as much precision as the other layers. So, the print speed should be adjusted and generally printed at low speeds. This can be easily resolved through a trial & error method. Remember that a strong infill will add to the strength of the printed part. Extrusion width settings can really be leveraged when printing infills. Users make the mistake of not playing with the extrusion width. Generally, the extrusion width is ignored and kept the same for the entire print. This robs the users of a very powerful tool to improve the print strength. By printing the infill with larger extrusion width, the infill can be substantially stronger. This again is a trial & error method as there is no ideal figure for the width. Just remember that increasing the infill extrusion width will also increase the amount of material deposited and so if the model is small then the infill pattern may overlap. So, it should be tried only with bigger models. Experiment with the infill pattern. Some infill patterns may not help augment a certain design while others may improve the overall strength. So, experimenting with the infill pattern will also help in eliminating the problem of weak infill. 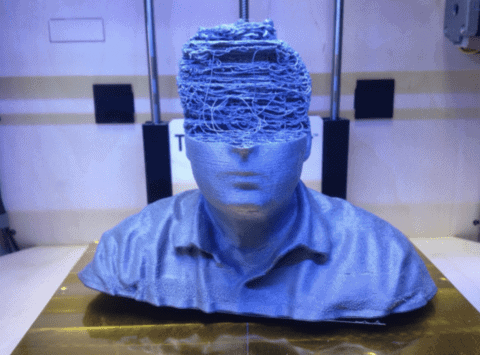 Stringing or oozing is also a common problem in 3D printing. This problem, again, can be easily eliminated through extensive trial and error techniques. To resolve this issue, users must understand the term ‘Retraction’. Retraction is the backward movement of the filament to prevent excess oozing of the malted material. By carefully managing this parameter, oozing or stringing problems can be eliminated. In the case of the slicer settings, you can only control two parameters, namely the Retraction speed and distance. We will look at other issues as well to control this problem. 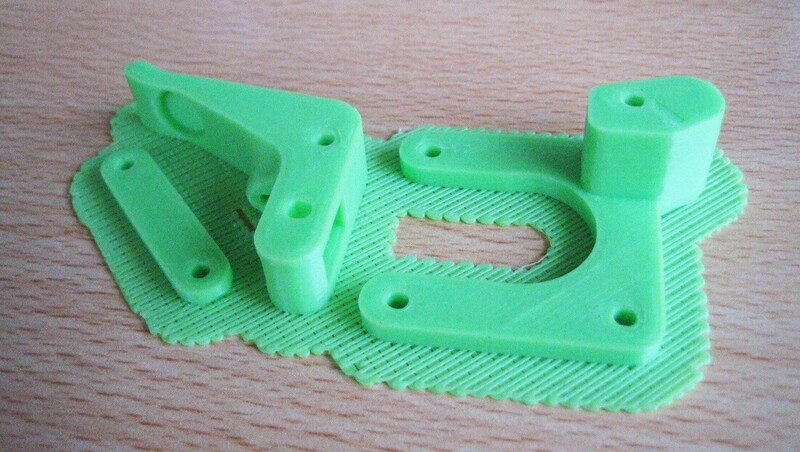 Continue reading to know the possible causes and their solutions to help you resolve the stringing problem in 3D printing. If the problem of stringing is faced by users then the first parameter to be checked is the retraction speed. This parameter controls the speed at which the filament is pulled back. If the speed is too fast then the melted plastic may break away from the unmelted filament above and the whole purpose of retraction is lost. If the speed is slow, then it may not help in reducing the oozing. So, the general solution is to design a model with subsequent towers at suitable distances and then try adjusting the parameters to check the stringing effect. By carefully controlling the speed, an ideal value may be found out. Retraction distance is distance by which the filament is pulled back. The retraction distance will depend on the extrusion system, direct-drive or Bowden-drive. The direct-drive extruders will work with small retraction distances (generally around 1-2mm) while the Bowden extruder system will require retraction distance of around 5-10mm. This distance will also depend on the type of material and the printer used, and so the distance will have to be carefully found out for optimum printing. 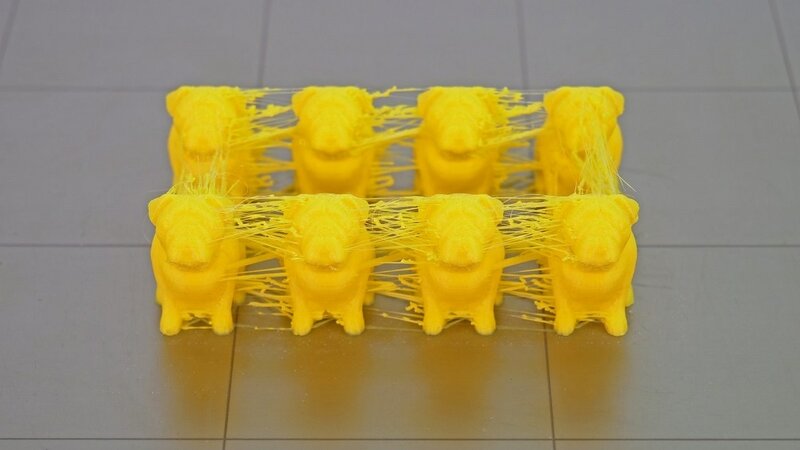 Oozing and stringing can also be affected by the printing temperature. If the temperature is too high then the viscosity of the material is lowered and the material drips even when the filament is retracted. A low temperature will stop the oozing but will affect the print quality. So, consider this parameter when setting an ideal print temperature. By getting inside the skin of the slicer settings users can work with settings which also controls the free movement of the nozzle. These settings help in finding the shortest route to the next deposition point or the travel movements can be controlled to avoid crossing an open space altogether. This eliminates the possibility of creating strings. As explained above, by reducing the travel, the stringing can be reduced. And so by increasing the travel speed of the nozzle, the oozing can be minimised. So, if the printer is able to handle fast travel movements then a higher travel speed will help minimise the stringing or oozing. While we round off the five common problems in 3D printing, we lastly cover Warping. Warping issue gives a headache to a lot of users, new and experienced. But if you understand the basics of the problem then it is really not so difficult to deal with it. Warping is caused when the deposited material cools quickly. While cooling, the material contracts and this causes the ends to be lifted up thereby causing warping. Warping also leads to cracks in the print. The main solution to eliminating the warping issue is it use a heated bed while printing with materials which undergo warping, namely ABS. The core idea is to keep the first layer heated and not let them cool quickly. This helps the initial layers to remain in contact with the build plate thus avoiding warping. New users generally do not play with slicer settings and so ignore this setting to eliminate the warping issue. Use advanced settings from slicer to switch off the fan completely or keep the fan speed to a minimum for the first few layers. The fan can be switched-on after those initial layers. By this step, the deposited material remains hot for a longer time. It is advisable to use an enclosure while 3D printing. While an enclosed 3D printer may be costly but this added expense will save you from issues like warping, nozzle clogging, etc. If you have the option to maintain the enclosure temperature then the printing will be easy and it will completely eliminate warping issues. In order to increase the build adhesion between the layers and the build plate, users can also look to new types of build surfaces and plates. A PEI (Polyetherimide) sheet offers extra bed adhesion or a perforated build plate is also available which also improves adhesion. Slicer software has bed adhesion tools like Brim and Raft (Explained in the first problem of this article). Users can make use of these tools. These were some of the most common problems encountered when 3D printing parts. As discussed earlier, this article is Part I of the series and we will provide solutions to more such common problems in 3D printing in Part II.